Suzy’s childhood dreams of dancing in Hollywood musicals had her falling in love with Frank Sinatra, and then Picasso. As an adult tapping her way through Europe, she became enchanted with the timeless sensuality of ceramics, collage and oil paintings. The figure dominates her work. She is compelled to create archetypal icons embracing the power of Ancient and contemporary World cultures, overlaid with the spirit of song and dance: Queen Nefertiti meets Lady Gaga. 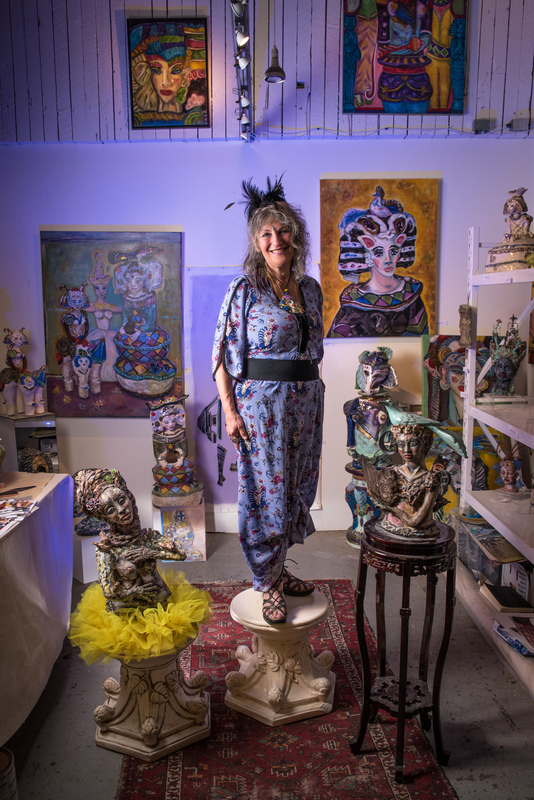 Whether working with fired clay surfaced with lustrously aged infusions, or canvas scrolls of collage and oil paint, her work simultaneously celebrates interconnectedness and individuality. Suzy’s latest “Tsipora” series, taken from her Hebrew name meaning Bird, exude an exotic earthiness living within the poetic imagination. Suzy’s work is exhibited, collected, and published locally and internationally. to Skopelos, Greek Island paradise & Preludes to Crete, Athens, Santorini….